SetCcExternalCertificateFilePathlnternal : The property 'Commond' cannot be found on this object. Verify that the property exists. “Commond”? Surely that’s a typo! I eventually managed to fix* it – and I’ll get to that shortly. (* It’s a bit kludgey). Put the appliance in maintenance mode by using the Enter-CcUpdate cmdlet. If the password of the new certificate is the same as the old, the import will be successful. If the password is different, you will receive an error that the password is wrong, and you will need to reset the password by running the Register-CcAppliance cmdlet with the -Local parameter, and then repeating step 2. Take the appliance out of maintenance mode by using the Exit-CcUpdate cmdlet. SetCcExternalCertificateFilePathlnternal : Password for C:\cce\SiteRoot\cceedgepool_gis365lab-12Jan2018.pfx is not correct. Run 'Register-CcAppliance -Local’ to input the right password then run this cmdlet to import the certificate again. In the vague hope that all this red wasn’t a show-stopper, I repeated Step 2 to find that it no longer reports issues with the password – good – but is now also stuck on this “Commond” error. (That’s actually the first image up the top of this post). 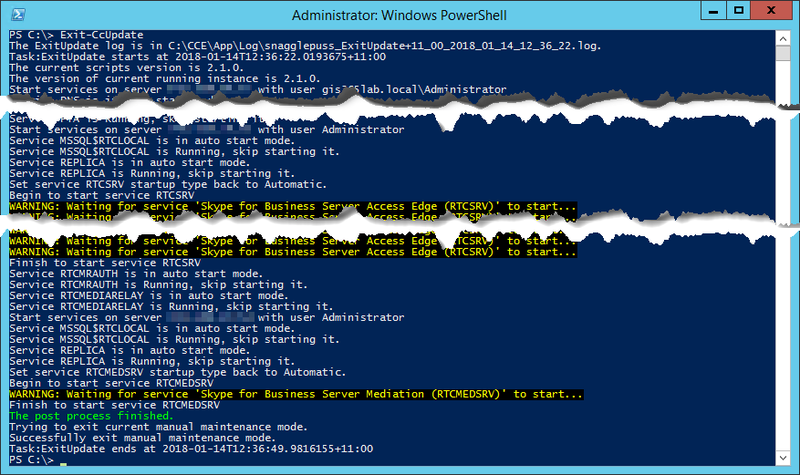 That only left me to close out Step 4 in the TechNet process with “Exit-CcUpdate” and we were all back up and running! Fellow MVP Ståle Hansen has since shown me the error of my ways. 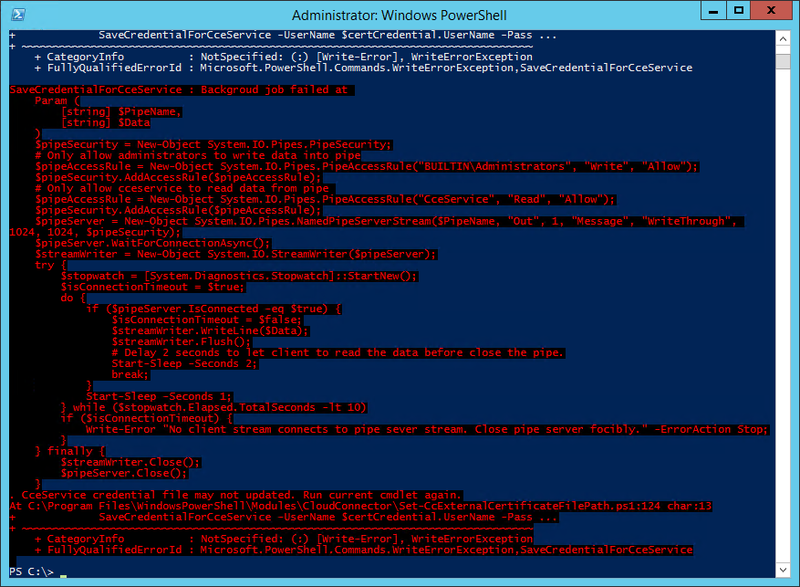 It seems .NET 4.6.1 is a pre-req for CCE v2.1.0, and having updated my host accordingly, $job no longer reports failure. The above took place on a “DIY” CCE, running on an old Dell PE-2950 & CCE 2.1.0. If you’re trying any of this debugging for yourself, every time you change any of these PS1 files you’ll need to reload the module. I chose to close and re-launch a fresh PS window. If you don’t, your code change won’t have taken effect. An alternative to a fresh window is to execute “import-module CloudConnector –force” in the current window. Keen eyes scouring the screen-grabs might see the odd instance of text like “made it to here”. Those are breadcrumbs I added into the modules as I was stepping through the debugging process, trying to narrow down the issue. You won’t have them in your deployment. 14th January 2018: This is the initial post. 14th January 2018: Added the Postscript.